The 5 are a group of multinational singers who grouped together as a band when they participated in the 3rd season of the X-Factor. Their latest single, Bel Gharam, accumulated over 15 thousand views on YouTube in its first hour of release. 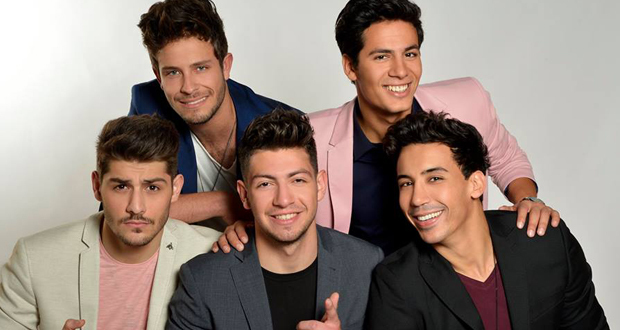 The 5 recently spoke with eniGma’s Mahmoud Al Badry for an interview that delved into their experience on the X-Factor, the group’s inner dynamics, and the inevitable comparison with the renowned group, One Direction. It was an amazing experience where we learnt a lot about music, life, and friendship. Every one of us came to represent his country as a solo, now we represent the entire Arab world. What is the biggest lesson you learned on the X-Factor? We need to be humble, professional, and hardworking artists to be able to become stars and remain at the top. What would you say was the biggest change between your pre and post X-Factor lives? We are now known professional artists and with that, comes a big responsibility, as we need to set a good example to our fans. Do you consider yourselves the Arab One Direction group? We don’t think that we are like One Direction; the only similarity is that we were both formed during the X-Factor show. Otherwise, we are different, as we come from four different countries and speak four different dialects along with our diverse culture and music. What’s the main inspiration for your music? Our inspiration comes from our musical influences, which are quite diverse given that we bring musical backgrounds from Egypt to Algeria to Morocco to Lebanon, a mix that no artist in the Arab world has done so far. From Rai to Shaabi to Jabali to Pop, our music will see more and more of these influences, as we are inspired by each and every one of them. Do you feel like your individual talents complement each other? Yes we believe so; that’s why the judges of X-factor saw that each one of us adds to the other more than if we were solo artists, hence our success throughout the show and with our released singles. Do you think you could have individually reached this level of success? Maybe; but we are stronger as five. Could you give us a little insight about how you guys interact together? We have grown to love each other like brothers. We listen to one another and democratically make decisions with our management/production company. Of course we goof and mess around with one another; the bond we developed over the past year grows day by day. Did Bel Gharam’s success surprise you? Yes to an extent. We knew that it would be a hit, but the success we had with the single and video so far is overwhelming. What are your plans for the future? Is an album in the works? We are planning a new EP with our company. It will be released at a certain point this year. We are working on our own material as well. As we always say: “what’s ahead is even better”.